Dr Angela Wood discusses how researchers from this theme use genetic data and biological information to help understand and manage diseases. Abdominal aortic aneurysm (AAA) is an enlargement of the abdominal aorta. It is predominantly found in men over the age of 65, and when it increases in size it can be dangerous and in some cases deadly. 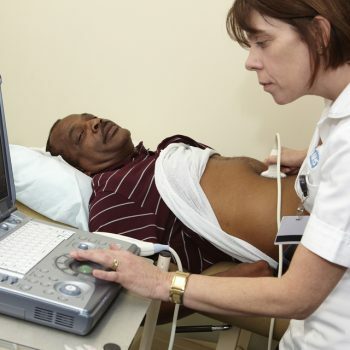 Cambridge researchers led a randomised trial to see whether performing ultrasound screening would identify men likely to develop a dangerous AAA, and investigate if early screening can provide long-term benefits. This was then followed up by a further health economic assessment of AAA screening. After inviting more than 33,000 men to ultrasound screening and analysing their results against a comparable group not invited, researchers were able to show that population screening of men over 65 could halve the number of deaths from AAA over a 10-year period. In 2013, the Department of Health in England introduced a national screening programme for men over 65, based on the data from Cambridge researchers which helped shape their policy. A year later Wales, Scotland and Northern Ireland introduced AAA screening for men, and other countries have also adopted the programme. This national AAA screening programme has saved many lives via early detection and treatment of AAA. Rajiv Chowdhury, University Lecturer in Global Health gave an interview to Cambridge TV to discuss the effects of air pollution.